Porsche revealed on Tuesday that it will be introducing the sport-themed GTS trim to its 718 Boxster and Cayman sportscars. Providing an up-to-snuff power increase to 365 HP and 317 lb. ft. of torque, the GTS treatment also adorns the 718 twins with splashes of black through the front fascia, headlights, and interior. The culmination of performance and an upgraded sport-appearance has made the GTS trim the most sought-after in the rest of Porsche's stable including the 911 and Macan, so it's likely that we will see much of the same story with the convertible Boxster and fixed-roof Cayman. Additionally, this middle-ground package takes the go-fast bits from higher spec'd models and retains the affordable options from the models' entry points, making it the prime choice for speed enthusiasts. Don't think of it as a compromise, though, as Porsche will tell you that it's not in the least. 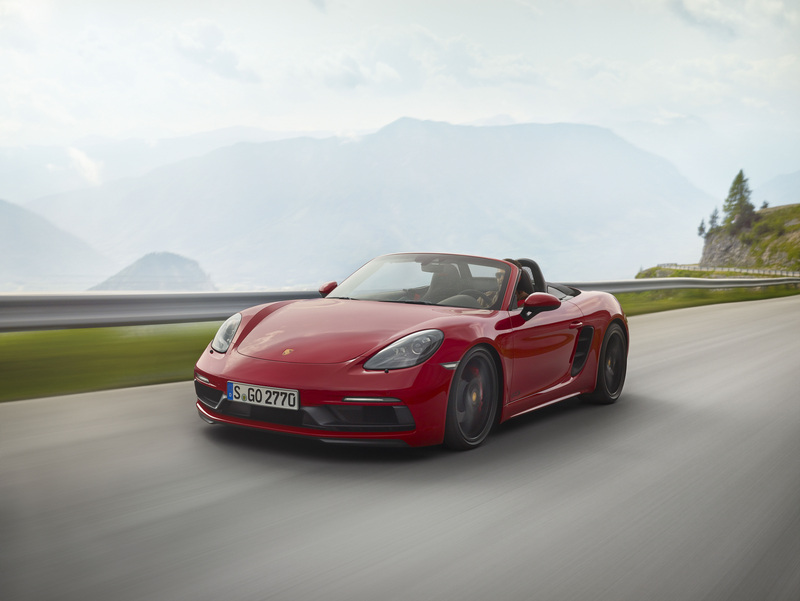 Instead, the Stuttgart manufacturer has improved the design of the GTS' intake plenum and optimized the turbochargers to extract 15 extra horsepower over the S-line 718 models. 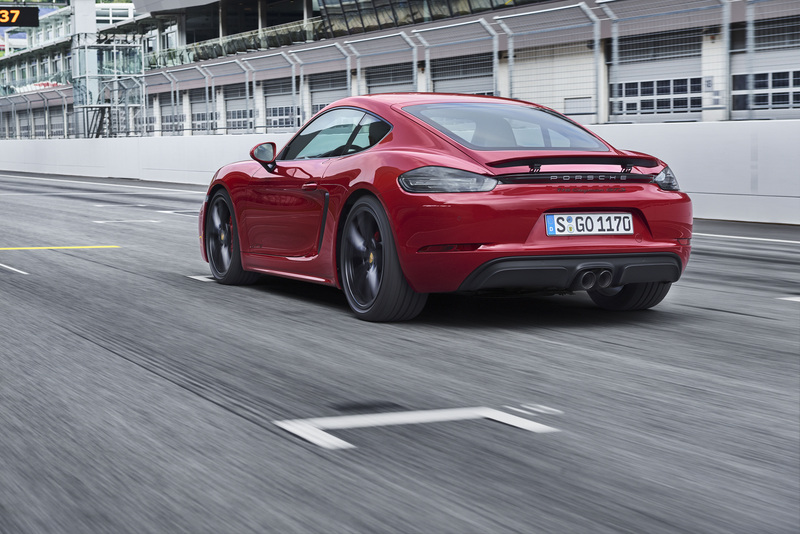 When equipped with the company's blitzkrieg 7-speed PDK gearbox, the refreshed Cayman can hit 60 MPH from a standstill in under 4 seconds–the same goes for the Boxster at 3.9 seconds as quoted by Porsche. Lucky for us, a 6-speed manual is still standard equipment for the models. You will, of course, get the German marque's top-of-the-line computer systems as well if optioned as so. Porsche Active Suspension Management (PASM) is available with the GTS, as is Porsche Torque Vectoring (PTV). Sport Chrono comes as standard, so you can expect nothing but the brand's best when it comes to driver-aid and dynamic-enhancement. The GTS also brings along a suite of aesthetic touches that are visible both inside and out. The car's exterior will feature noticeable differences like the darkened lower fascia, tinted headlights and taillights, and matte black 20" wheels. This theme carries on to the cabin with Alcantara trim throughout as well as unique GTS trim and stitching. The 2018 718 GTS models are now available for order and should start popping into showrooms by March 2018. Pricing for the Cayman version begins at $79,800 while the open-roofed Boxster clocks in just a bit higher at $81,900 before delivery fees. This slots the range-topping 718 GTS in comfortably below the base 911, creating a bit of room between the two while still notching a loftier price tag than some of their German rivals, the Audi TT RS and BMW M2. The Top Gear host recently got his hands on a gorgeous silver Boxster with a red interior that has me all aquiver. A gorgeous car, shame about the sound though? KBB Calls Porsche's 718 "The Finest Sportscar On The Market"
They even make that claim without any price constraints.